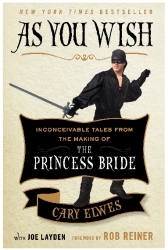 Actor Cary Elwes, who played Westley in this movie, was inspired to share his memories and give fans an unprecedented behind-the-scenes look into the creation of this cult classic film while participating in the twenty-fifth anniversary cast reunion. His first-person account of the making of the film comes with exclusive photographs and interviews with costars Robin Wright, Wallace Shawn, Billy Crystal, Christopher Guest, and Mandy Patinkin, as well as author and screenwriter William Goldman, producer Norman Lear, and director Rob Reiner. Well, I assume that for everybody who loves the film as much as I do, this book is a must-have in any case. Yet be assured that this volume offers more than just collector´s value: Elwes´ (and Layden´s) style mirrors the movie´s appeal, the use of language reflects the duelants´ virtuosity; recounts of what happened are spiced with a great sense of humour. Which makes this book extremely entertaining to read - I found myself hypnotized by its spell until 5 a.m. , as I simply was unable to put it down ... This book will give you surprising insights, many laughing fits and a bit of heartache as well - in other words, an overall heartwarming experience, just like the movie.